With each loss the frustration escalates, but what is a fanbase to do when a baseball club alleging to be in a rebuild looks worse than it did a year before? On paper, this wasn't supposed to happen. The Phillies entered spring training with an improved outfield, a stronger bullpen, and some low risk, high-reward veterans inked to one-year deals. The club wasn't expected to compete for a postseason berth, but there was an expectation the club would improve on last year's win total of 71. Fast-forward to the present and the Phillies sit with the worst record in baseball, on pace to lose 106 games - the most in franchise history since 1961. 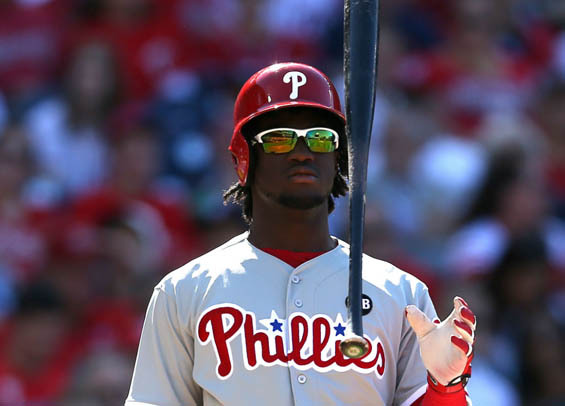 Things need to turn around and it needs to happen immediately, but that change has to come in the form of production from Maikel Franco and Odubel Herrera. Both players were expected to advance in their development this year, particularly Franco, but both have struggled mightily through the first quarter of the season and seemingly regressed. Franco is hitting .209 on the season with an OPS+ of 64 and Herrera is even worse, hitting .217 but with an OPS+ of 58. Looking at WAR by position, the Phillies rank 28th at third base (-1.3) and 23rd in center field (-0.5). Rebuild or not, you can't compete with lackluster offensive output at those two positions. Throw in Michael Saunders and his rough start in right field, compound that with a starting staff that routinely struggles to pitch beyond the fifth inning and a bullpen prone to the long ball and you see why the Phillies are eyeing a 100+ loss season. The Twittersphere argument though, promote the prospects from Lehigh Valley and Reading en masse, isn't a plausible solution. Fawning over minor league statistics and prospect lists can only go so far. Success at one level doesn't necessarily equate to success at the next. The Phillies have a questionable track record with prospects, touting some that just never panned out. The Kyle Drabek's and Joe Savery's. The maturation process isn't an exact science and can't misses often do in fact miss, so care needs to be taken in handling the potential future of baseball in Philadelphia. Dylan Cozens, Jorge Alfaro, and J.P. Crawford all appear to have the talent to be everyday big leaguers but throwing any one of them - or another top prospect - into this mess right now is irresponsible. The Phillies have won six games all month, plus you have a pair of starters in Franco and Herrera, long believed to be key components of the final product post-rebuild, essentially alternating spots on the bench every night because neither is producing. The timing just isn't right. The atmosphere in the clubhouse isn't conducive right now for a young prospect to feel at ease and perform. If Cozens goes hitless through 20 at-bats, what then? More negativity in an already disastrous situation. Rebuilds are never easy. Things weren't supposed to be this bad, but the front office had a vision for this team to realistically compete within the next year or two and that still is realistic. The prospects will be here soon enough, but the parts of the future already here - Franco and Herrera - need to turn things around. That's the first step for the Phillies in getting out of this funk.